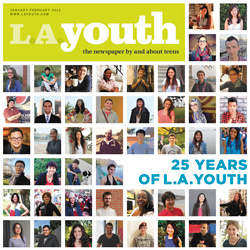 25 years of covering Los Angeles from a teen perspective. Tough economic times, foundation cuts and moving our office by March 1, 2013, have overburdened our budget and placed an undue amount of financial strain on the L.A. Youth family. While we celebrate our 25th anniversary this month we are regrettably closing the doors on this extraordinary organization at the end of February. This is our last edition of L.A. Youth. I took my anger out on others until a school for troubled kids helped me change. L.A. Youth alums share how writing, illustrating and taking photos for the newspaper shaped them. Six teens discuss how their families have struggled and how their views of poverty have changed. WITH survey results. Words have been the backbone of L.A. Youth, but without visuals those words wouldn't have had much impact. So here we highlight some of our best illustrations and photos. Tying our past to our present, a current L.A. Youth writer looks back at some of our best pieces giving a teen's view of major news and our own investigative stories. Tying our past to our present, a current L.A. Youth writer looks back at some of our best stories highlighting some of the issues gay and lesbian teens face. After seeing her friends' relationship drama, Sydney, 17, is happy to be single. My dad's ex-girlfriend has become a mom to me. Tying our past to our present, a current L.A. 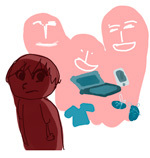 Youth writer looks back at some of our best stories highlighting some of the issues teens in foster care and the mental health system face. Tying our past to our present, a current L.A. Youth writer looks back at some of our best stories highlighting students' exploration of race and identity. Tying our past to our present, a current L.A. Youth writer looks back at some of our best stories highlighting the joyous, painful and serious sides of teen relationships. Tying our past to our present, a current L.A. Youth writer looks back at some of our funniest stories. The shooting in Connecticut made Susie realize that the United States needs to change its gun laws. Kari, 14, is no longer the quiet kid in class thanks to her new school.